View More In Laptop Replacement Parts - Page 2. 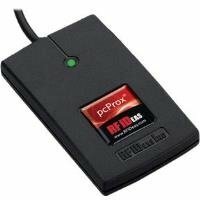 Physical AccessRF IDeas' pcProx Enroll card readers are designed for customers seeking to leverage their existing card system for applications beyond building access. These readers are engineered and designed to work with nearly all proximity and contactless smart card technologies. The 13.56 MHz model is compatible with most contactless smart cards and the 125 kHz proximity model provides error-free identification for over 300 million physical access cards in use worldwide. Picture may not match actual product. Please ensure that your original part number matches this exactly, or check with the manufactuer for compatiblity. Customers are responsible for compatiblity. Please ensure that your original part number matches this exactly, or check with the manufactuer for compatiblity. Customers are responsible for compatiblity. This part is guaranteed to be fully functional, original and authentic. If you have any questions about this product by RF IDEAS, contact us by completing and submitting the form below. If you are looking for a specif part number, please include it with your message.